Online registration closes at midnight Nov 6, 2015. To inquire about registering after online registration is closed, please call the Canscaip office: 416-515-1559. Online registration is now CLOSED. 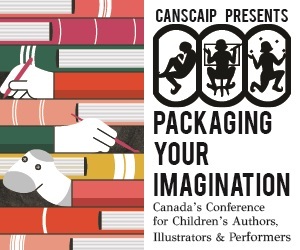 To inquire about registering, please contact office@canscaip.org. Can't be there in person? Virtual PYI can be live-streamed to your computer. CANSCAIP is proud to partner with the Humber School of Creative and Performing Arts in presenting our conference. CANSCAIP is grateful for the support of the Toronto Arts Council. A lunch of salad and sandwiches is included with registration. We regret that no dietary requests can be accommodated. Refunds with a cancellation fee of $45 until October 15. We regret no refunds can be offered after that date. For more information, email office@canscaip.org or call (416) 515-1559. Are you getting the most out of your antagonist? A closer look at the role this character plays, as well as a few ways you can inject new life, purpose and depth into the thorn in your protagonist’s side. You’ve come up with a great idea. In fact, it’s the perfect idea for a picture book story. Now what? In this engaging workshop, explore the journey from inspiration to publication from an author's perspective. Topics will include revisions, submissions, and more. Must-know info on how to negotiate your way through a typical Canadian book publishing contract and how to choose your battles with your publisher. Sally Keefe Cohen is a Canadian literary consultant, based in Toronto, who has negotiated book contracts for Canadian writers and writers’ estates for over 20 years. Her clients include children’s book authors, illustrators, cookbook authors, academic writers and writers of fiction and creative non-fiction. She acts on behalf of previously unpublished and published authors to ensure that their rights are protected and the most favourable book contract possible is completed. SFF is a genre with a rich history: How do we balance the—half-century-old!—tropes we love with crafting meaningful work for young readers, whose magic worlds and possible futures are built on entirely different assumptions? Join our terrific panelists for a discussion of trope sets, craft pointers and industry trends in YA’s science fiction, fantasy and horror section. Every picture book has a visual life. It’s more than a collection of images; whether richly complex or elegantly simple, it’s a matter of design. This workshop looks into what makes both the pictures and overall story come alive as well as 10 things you should keep in mind when designing your characters and your visual story. Author visits are an excellent way to augment income, but how can you carve your own niche in this competitive market? Once you get a yes, what happens then? And how do you create the content of the visit itself? Is there a way to transform a single request into more? How do you become a dream visiting author? Olga Filina joined The Rights Factory in 2013. She has been sales manager and buyer for national and independent book store chains, and literary assistant at The Cooke Agency. She represents authors of historical fiction, romance, mystery, business, lifestyle and memoir, and young adult and middle grade novels. Carrie Gleason is a seasoned editor of children's and YA books, and currently managing editor at Dundurn Press. She is also a published children's author. Lynne Missen has been editing books for over 25 years, and is Penguin Canada's Publishing Director, Young Readers Group. She has worked with acclaimed Canadian children’s authors Susan Juby, Eric Walters, Kenneth Oppel, Kit Pearson, Valerie Sherrard and Caroline Pignat, among others. MODERATOR: David Bennett and his wife, Lynn, founded Transatlantic Agency, developing a client list of talented children’s writers and illustrators whose works he sold into the UK, US, Europe and Canada. Transatlantic is now a full service literary agency covering adult trade, children's and young adult authors, and illustrators. How do we get ideas for illustrations and stories? Where do they come from, and what do we do with them when we have them? How do we recognize the good ones from the bad ones? Learn about keeping a virtual shoe box of inspiration and images, and other methods of capturing new ideas and encouraging creativity. Been sitting on an idea for years? Are you ready to start your own novel? Participants will learn how to develop their ideas, create an exciting, immersive universe and the characters to go in it, and carve out the necessary time to write their own amazing novels. Are you curious about what happens once an editor decides s/he likes a picture book manuscript? Groundwood Books publisher will give insights into what happens in-house. Discussion topics include what editors consider before an offer to publish is made; what happens during the editorial, illustration and design process; and what to expect after publication. Sheila Barry has been publisher of Groundwood Books since 2012. She speaks and writes frequently on all aspects of children's book publishing, and is currently serving as Vice-President for both the Book and Periodical Council and the Canadian chapter of the International Board on Books for Young People (IBBY Canada). There’s a story from history or from real life that has fired your imagination. Or maybe you just like the idea of writing non-fiction and are in search of ideas. This workshop will walk you through the process––from the idea stage right through to the writing, publishing and promoting of real stories for real kids. You’ve written your manuscript. You’ve revised it (and revised it, and revised it...). Your portfolio looks great. You’re ready to take the next step! But how? Learn the basics of writing query letters and submissions in this workshop that will give you the tools to identify the difference between a good one and a GREAT one. Ishta Mercurio has been writing and critiquing queries since 2009. Her first query was awful, but her most recent query was great enough to get her several full requests and an offer of representation. Her first book, Bite into Bloodsuckers, is coming in 2015. She blogs about queries and other writerly things at ishtamercurio.blogspot.com. Sheryl Shapiro has been creative director / art director / designer at Annick Press for almost 25 years. A few years after completing four years of training in fine arts and teaching, she changed careers, graduating from OCAD in editorial design. Sheryl has also co-authored children’s books and worked in other areas of design. Books by the speakers will be available to purchase on-site. Space runs out quickly for these unique and highly useful sessions pairing individual participants with industry experts. Formerly called Pitch Perfect and focused on evaluations of manuscripts and illustration portfolios, One-to-One has been expanded to include author websites and social media. Plus, by popular demand, these sessions have been lengthened from 10 minutes to 15 minutes. Each One-to-One participant communicates directly with an expert about writing, illustrating or (NEW!) website/social-media development. Manuscripts, illustrations and websites are submitted to the experts for evaluation a few weeks ahead of the conference, in preparation for the One-to-One meetings with the creators. Registration for the Packaging Your Registration conference is required for One-to-One sessions (you can’t register for One-to-One only). David Bennett is the founder of Transatlantic Agency, a full service literary agency covering adult trade, children's and young adult authors, and illustrators. Olga Filina is an agent at The Rights Factory. She represents authors of young adult and middle grade novels. Carrie Gleason is the Editorial Director at Dundurn Press. She previously worked as a children’s books editor at Crabtree Books, Scholastic Canada, Maple Tree/Owlkids Books, and James Lorimer & Company. She is also the author of twelve non-fiction books for children. Sheryl Shapiro is the creative director / art director / designer at Annick Press. Lynne Missen has been editing books for over 25 years, and is Penguin Canada's Publishing Director, Young Readers Group. Peter Carver has worked in publishing for almost 40 years, concentrating on books for children and teenagers. Since 1996, he has been editor of children’s and young adult literature for Red Deer Press. He taught writing for children courses at George Brown College from 1986 to 2011, and has given many other writers’ workshops, from St. John’s to Nanaimo. CANSCAIP will select the publisher or agent for your One-to-One session. Complete information and schedules will be emailed to registered One-to-One participants prior to the conference. Receive a 15-minute, One-to-One portfolio critique with an art director. Artwork is not previously submitted. Illustrators bring 10 completed illustrations for critique plus relevant thumbnails and sketches. Illustrators may bring more work, but it may or may not be critiqued as time allows. CANSCAIP will select the art director for your One-to-One session. Complete information and schedules will be emailed to registered One-to-One participants prior to the conference. Published authors and illustrators (and unpublished too) will benefit from a 15-minute One-to-One review of their author website, Facebook author page or Goodreads author page. You'll get expert advice on practical, simple changes you can implement right away to upgrade your brand, help build your reader community, and better market and sell your books. One-to-One participants will be requested to submit links to their website, Facebook and/or Goodreads author pages a few weeks ahead, for our experts to evaluate in preparation for the 15-minute session with you. CANSCAIP will select the marketing expert for your One-to-One session. Complete information and schedules will be emailed to registered One-to-One participants prior to the conference. Artwork by CANSCAIP Members and Friends will be on exhibit at our Paging Imagination Art Show at Humber College Lakeshore Campus (venue of our PYI conference) in the L Space Gallery from November 10 to 20, Monday to Friday from 10:00 to 5:00. The show will be open to the public and the Humber community. The L Space Gallery will be open on Saturday, November 14 so PYI attendees can enjoy the art. Art is a meaningful, lasting, one-of-a-kind gift, for yourself, or for your family and friends. Some of the illustrations at the show will be for sale – you might just see a work of art that you can’t live without – so remember to bring your cheque book to PYI! BE OUR FRIEND—SPECIAL PYI DEAL! New to CANSCAIP? Want to find out what being a CANSCAIP Friend is all about? Join the community and keep growing as a writer or illustrator. Expand on what you learn from our exciting lineup of workshops and grow your network of children's culture creators as well. As a Friend you receive our quarterly newsletter, CANSCAIP News, featuring profiles of our professional members explaining how they practice their craft, up-to-date marketing information and cross-country news about what’s happening in the children's literature community.